DePaul sophomore forward Jade Erikson-Russo tracks down Marquette senior forward Carrie Madden during the first half of DePaul's 0-0 draw with Marquette. 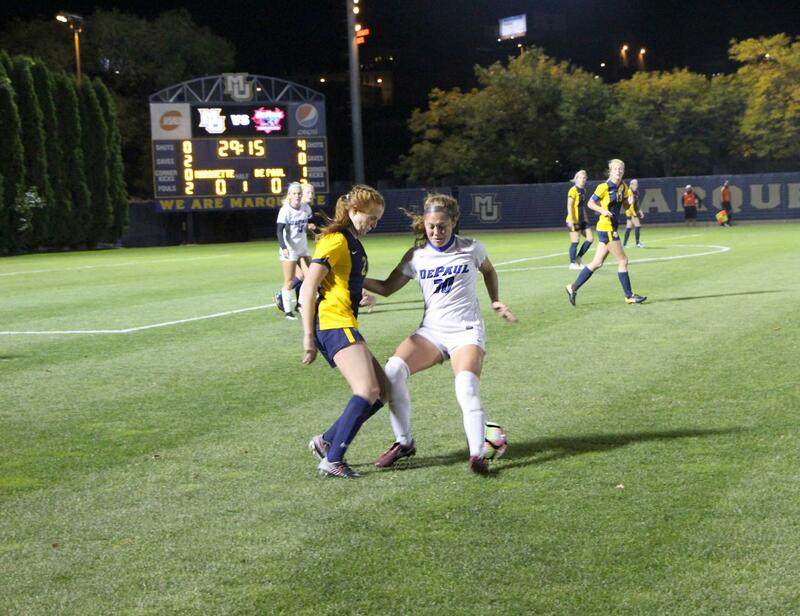 The trip up I-94 to Valley Fields, home of Marquette women’s soccer, has traditionally been challenging for DePaul (6-5-3; 2-2-1 Big East), and Thursday night was another grind as they battled to a 0-0 draw with the Golden Eagles. While disappointed to only walk away with one point instead of the three points a victory would have brought, head coach Erin Chastain was happy her team was able to secure a point on the road at a place they have only won once since 1996. Senior forward Franny Cerny also credited her teammates for maintaining their composure in a game that featured 25 fouls between the two sides. On a cold and windy night in Milwaukee, both sides controlled the half in which they had the wind at their backs with the Blue Demons ring o 13 shots in the first half, while the Golden Eagles responded with six in the second half. However, DePaul appeared to have a breakthrough midway through the second half however as Cerny got behind the defense to put away a shot in the right corner of the net. e referees, however, whistled the play dead for o sides. A er the game, Chastain and Cerny lamented this missed opportunity but were pleased to have created it. Though Cerny felt she had stayed behind the defender, she was happy to have at least created a good opportunity with the Blue Demons fighting the wind. The final minutes of regulation saw both teams create good opportunities with the Golden Eagles hitting the crossbar twice in the 86th and 106th minute, and DePaul forcing Marquette goalkeeper Maddy Henry to make a series of saves, including one on Cerny from point blank to keep the game tied. e senior forward thought DePaul had secured a late win with five minutes to go, but was optimistic eventually those opportunities would turn in their favor. To keep the game tied, the Blue Demons also received a gutsy performance from freshman goalkeeper Mollie Eriksson who played aggressively and decisively throughout. Eriksson, who finished with six saves, said she had heard a lot about the rivalry coming in, and was admittedly nervous, but knew from the beginning it was going to be an intense challenge. From there, Eriksson wasted no time leaving her goal to challenge plays at the edge of the box or even outside the box late in the game. The Blue Demons schedule now turns in their favor with three of their last five matches at home starting with Butler on Sunday afternoon. On Sunday DePaul (6-5-3; 2-1-1 Big East) played host to Xavier. A er needing overtime for the third straight game, the Blue Demons lost 3-2. After a scoreless first half, Xavier took a 1-0 lead within the first four minutes of the second half. e Musketeers extended its lead in the 64th minute. The Blue Demons responded in the 71st minute with a goal from senior forward Madeline Frick. Four minutes later senior forward Frannie Cerny scored her seventh goal of the season. In double overtime Xavier scored the game winner with a penalty kick.